The PT-RZ31K is an ultra-high-brightness 31,000 lumen laser projector that provides industry-leading image quality and functionality for high-end production environments. We knew we had to offer the PT-RZ31K to our clients. It’s one of the most powerful, most feature-packed laser projectors on the market today, and we’re sure that our clients serving the high-end of the production market will greatly appreciate having access it. 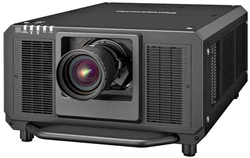 Rentex, one of the largest, most respected providers of audio visual & computer rentals, is pleased to announce that it’s added Panasonic’s flagship PT-RZ31K laser projector to its nationwide inventory of audio visual rental equipment. The PT-RZ31K’s ability to generate bright images with an impressive 20000:1 contrast ratio is just a part of what makes it such a special laser projector. Over the years Panasonic has developed a reputation as a recognized leader in laser projection by developing technologies to extend the basic functionality and image quality of its laser projectors. The PT-RZ31K features new versions of many of these technologies. Panasonic’s Real Motion Processor, for example, enables the PT-RZ31 to interpolate video images and reproduce a life-like 120 Hz refresh rate while reducing motion blur. The PT-RZ31K also comes equipped with an updated version of Panasonic’s Detail Clarity Processor, which uses a proprietary algorithm to search each individual video frame to identify fine textures and details, and then optimize each of these elements for sharpness and contour using a four-band filter. Panasonic Daylight View 3 technology uses the projector’s onboard sensors to gather ambient light information from the production environment and make automatic adjustments to ensure the quality of the projection. The PT-RZ31K, like all laser projectors, is an evolutionary leap in projection technology that offers many fundamental improvements over older lamp-based models. This includes the ability to quickly turn on and turn off without having to wait for a bulb to heat up or cool down, and much greater power efficiency. To learn more about the PT-RZ31k and laser projection technology, see the links below. Founded in 1980, Rentex is one of the largest and most trusted wholesale providers of audio visual, production, and computer rental equipment in the nation. Rentex is a longtime leader in the cross-rental market supplying many of the nation’s largest companies with complete audio visual rentals and 24/7 sales & technical support. Rentex can deliver nationwide within 24 hours and offers same day delivery to most major cities. To view all available rental equipment and request a rental quote, visit http://www.rentex.com or call 800-574-1702.